The Major League Soccer season will kick off as scheduled on Friday after a new collective bargaining contract was agreed, avoiding the threat of a players' strike. The new five-year deal was reached after four days of negotiations. The agreement is a contract to promote the mutual interests of MLS, the players and their union. "I am pleased to announce we have reached an agreement in principle," said MLS commissioner Don Garber. There was a similar dispute in 2010, although that was resolved with five days to go. 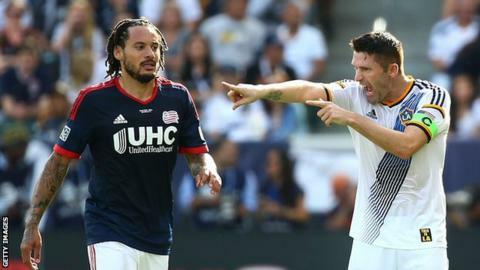 The first game of the 2015 season is between champions Los Angeles Galaxy, captained by Robbie Keane, and Chicago Fire (Saturday, 03:00 GMT). Chicago had flown out to LA despite the dispute. As part of the new deal, a form of free agency will be introduced, although it is limited to players 28 years and older with at least eight years in the league. The deal also includes a rise in the minimum wage in the league and the overall team salary cap, although full details are yet to be announced. Former England midfielders Steven Gerrard and Frank Lampard will join their MLS franchises, LA Galaxy and New York City respectively, at the end of the current Premier League season.